With Masterchef Australia on for five days consecutively (Sundays to Thursdays), and on repeat on Saturdays, it is no doubt that this program has had an effect of encouraging viewers to try out different cooking techniques in their own homes. Whilst at cooking school at TAFE, we did not really fiddle much with smoking our ingredients as a cooking techniques due to lack of time in class. In the past few episodes recently, a couple of the contestants have been using a smoking gun to smoke their sauces as well as their meats. A check on the internet reveals that a smoking gun costs at least $100 over. Since I am a DIY person, and cheapskate, I decided to not go that path. On Queen's Birthday, Anaconda was open. So I decided to take a run to the shops, and they were having sales. Good timing, I say. Since it also happened to be the day that my parents were flying off to KL, I decided to make dinner. So a kale salad with onions, sun dried tomatoes and lemon dressing it was, Smoked Lamb, and hot steaming rice it was. 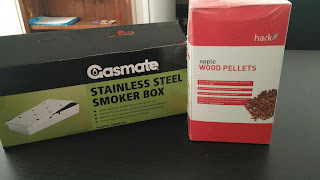 and Apple Wood Pellets for $6. 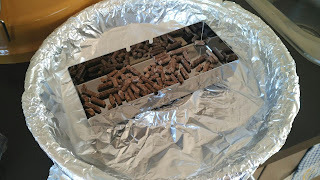 A makeshift smoker using aluminium foil to cover the open holes. A 1984 Uni-Grill I picked up at Salvos for $5. 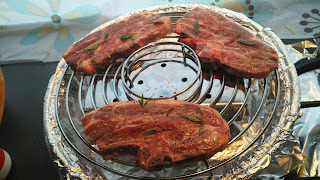 Verdict: Since it was my first time smoking a lamb, I was a little bit lost on what I should and should not do. But smoking is essentially a different way of cooking food. I worked out a method on how to ensure my smoking was done. 1) Your nose is the best technique to ensure that the food is ready. When meat is cooked, it releases and aroma that alerts your nose to know that the food is almost there, if not already close to be ready. Also your eyes can tell by the colour of the meat if it is ready. - Rare 60, Medium Rare 60-65, Medium well done 70, Well done 75. I was aiming for Medium Well Done. 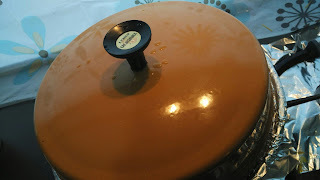 As I had a digital dessert thermometer (which I had ordered on Ebay), I raised the flame to high, and the external temperature of the stove up to roughly 150 degrees celcius. Using my thermometer, I waited till the temperature went down. It is not a good idea to keep opening the cover to check if the meat is done as that means heat loss. 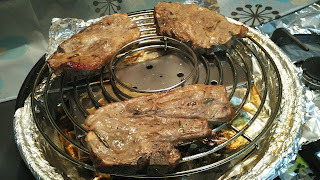 However when the meat was almost done, it released an aroma that I could smell even from outside. That's how I knew the meat was cooked and almost ready. 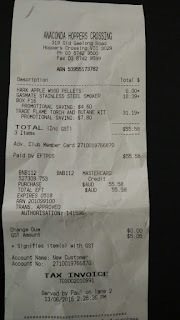 I was at Bunnings Hoppers Crossing when I was out running today, and they were selling dial oven type meat thermormeters for less than $5. I would say to invest in one, or two, as they are the kind you can leave inside the ovens or in the stove as they cook.